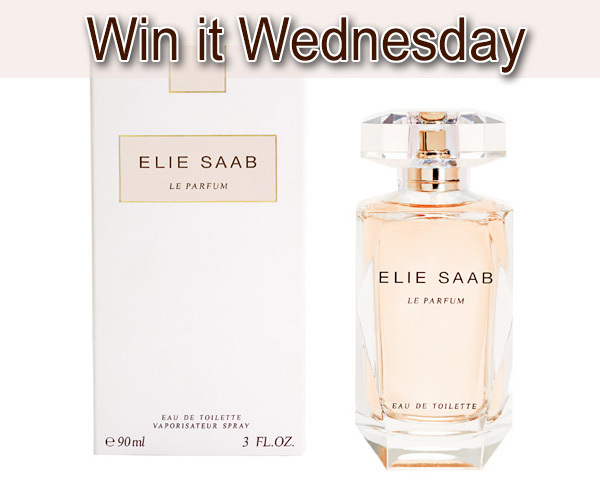 Win it Wednesday: ELIE SAAB Le Parfum Eau de Toilette. Today's flash giveaway is for one HUGE 3 oz. bottle of the brand new ELIE SAAB Le Parfum Eau de Toilette, worth $105.00. This fragrance won't even be available until the fall, and I have it here for your first. The new Eau de Toilette version of his highly successful 2011 debut fragrance - ELIE SAAB Le Parfum is a lighter more radiant scent. The launch completes Elie's original dream in fragrance. Like a precious jewel in a graceful new setting, sparkling facets of Mandarin tree blossom, gardenia and vetiver blend harmoniously with warm honey rose to make Elie Saab's eau de toilette offering every bit as addictive as the original. To enter this sweepstakes, fill out the rafflecopter widget below. The Win It Wednesday Sweepstakes (the “Sweepstakes”) is intended for participation only in the United States (excluding Rhode Island) and shall be construed according to, and governed exclusively by, United States law. Do not participate in the Sweepstakes if you are not a legal resident of the United States (excluding Rhode Island) physically located in the United States (other than in Rhode Island) at the time of entry or do not fall within the eligibility requirements set forth in these official rules. PROMOTION DESCRIPTION: The Sweepstakes begins on or about August 1, 2012 at 12:01 a.m. Eastern Standard Time (“EST”) and ends on or about August 2, 2012 at 12:01 a.m. EST (the “Promotion Period”). By participating in the Sweepstakes, each entrant unconditionally accepts and agrees to comply with and abide by these Official Rules and the decisions of Beautiful Makeup Search (“Sponsor”), which shall be final and binding in all respects. Sponsor reserves the right to modify or terminate sweepstakes if conditions arise that compromise its integrity or intended play. TO ENTER: Fill out the widget on this page. Winner will be randomly chosen by widget on or about August 6, 2012 and be notified by email left by entrant in the entry widget. Winner has 48 hours to respond or prize will be forfeited. All decisions by the sponsor are final. PRIZE DELIVERY: Sweepstakes prize will be delivered within 3 weeks of sweepstakes promotion period ending. Sponsor cannot be held responsible for the prize once it leaves them for delivery. La Mer The SPF 18 Fluid Tint.